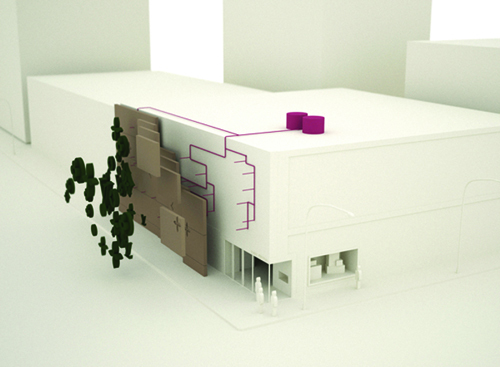 In 2006, TOPIADE was the worlds first, fully articulated moving pin and lay-over facade structure designed to enable a renewal of an existing retail store building without major reconstructions. TOPIADE was created by identifying central attributes of the famous French fashion brand, Louis Vuitton : luxury, French Heritage, and craftsmanship. The designs that produced were of this nature and could be thought of as conduits to the outside and the inside. Simply the goal was to create a LV building “alive” and to make it so that people are able to experience this “aliveness” each day that they own and use a LV product. 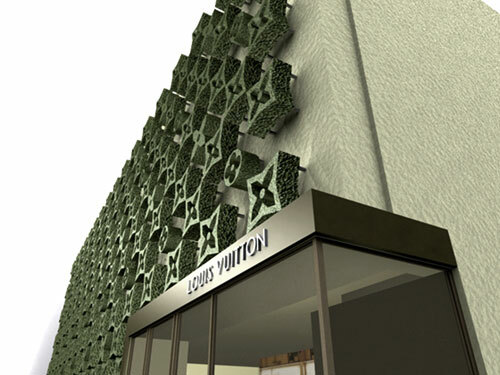 of modular facade systems applicable to Louis Vuitton. 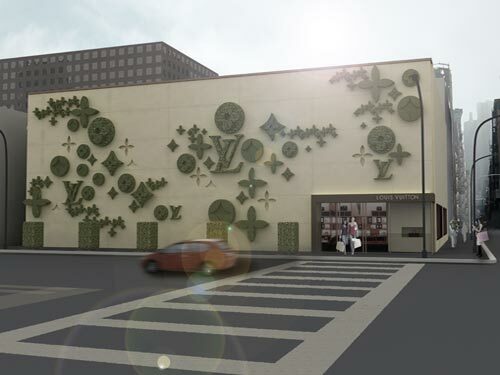 TOPIADE brings to the facade of a building a vertical version of the luxurious and traditional french garden that redefine Louis Vuitton’s virtue. Several variants are proposed within the concept. 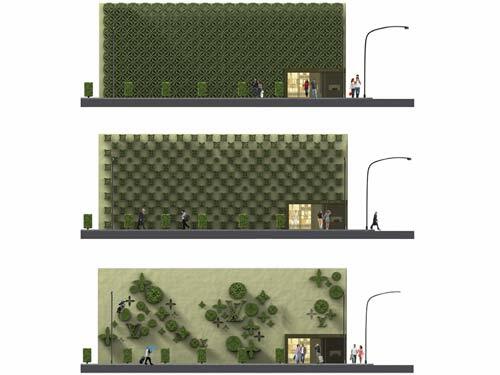 Real topiary blocks are arranged on the facade, behind them is a net of water / nutrient feeding system. every so often, a real gardner is to be dispatched and maintain the topiary plants while creating an interesting scene around the building. 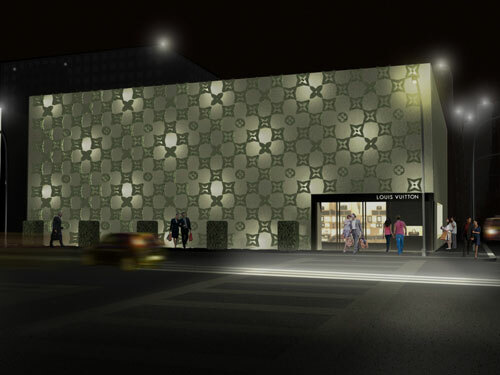 In late 2006 TOPIADE was further developed with an interactive addressable 3D scanning programmatic interface: the ability to define moving blocks of topiary panels based on programmatic controls and further the use of holographic display systems a further innovation to Louis Vuitton’s already expanding endeavors to the future of design and art. 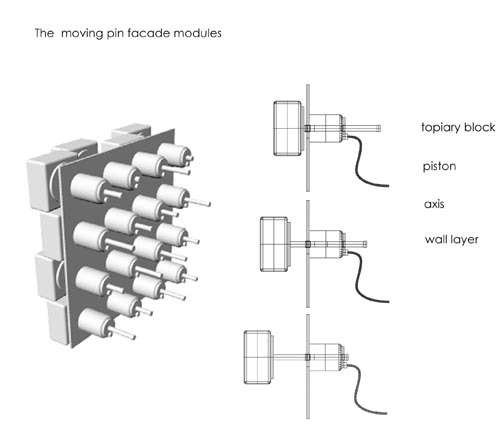 TOPIADE, one of iGNITIATE’s most groundbreaking projects has been covered by countless news publications including: Jetson Green, Designers Party , Design Boom, NotCot, Treehugger, InHabit, MIT In-Form, Paris-Tech, Center for High Rate Nano Manufacturing, Dezeen, IFMA, BTOES. Landscape Urbanism, CeDrus, GoGreen, Surface Pattern Design, and many others.